What do you get when you combine a potent, six-speed, 196cc reed valve-inducted two-stroke single and industry-leading light weight? 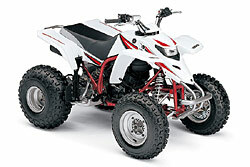 Oh, and let's not forget what's arguably sport ATV-ing's most attractive price tag. Answer: The Blaster®. Providing more than enough quick-hitting propulsion to get you into all kinds of exciting places, but light weight and nimble enough to get you back out. ... that help make the Blaster an unbelievable bargain. It looks like a million bucks in its aggressive bodywork and multi-reflector headlight, and yet the price tag reads like a misprint. Crazy, isn't it?